The CompUSA clear trackball mouse is a wonderful addition to a MAME cabinet. 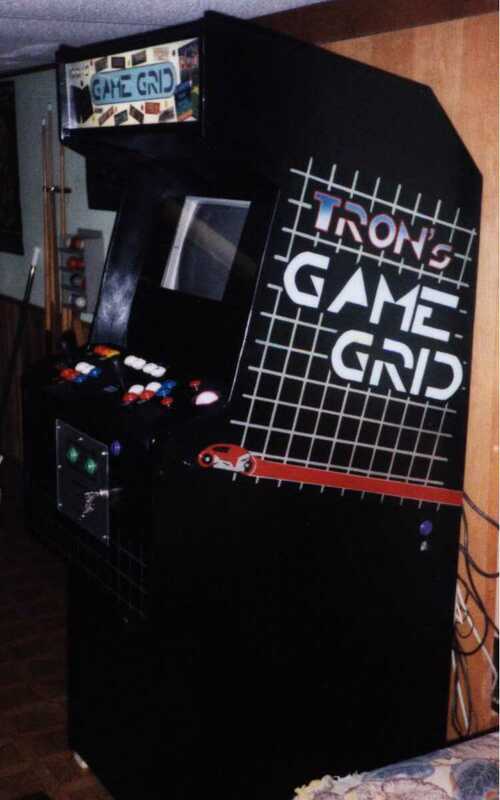 I discovered it on the way to building “Tron’s Game Grid”, my cabinet. Here’s what I learned that you might have one as well. This trackball plugs into your regular COMport and functions like a mouse. It glows a powerful red in the default setting, and a pale green when you press a mousebutton.. The trackball is in an entirely clear case when you get it home, but we’ll be tweaking that a bit. It has an odd sloped shape (but that is not a problem) and three molded-in pushbuttons. We will be soldering wires from two of these to run to standard Happ pushbuttons on the control panel. Here’s how the trackball looks mounted in my arcade machine. I mounted mine on the right hand side of the case; it is perfect for Missile Command, but I did place it too far back for a good game of Birdie King 2. I would have moved it a bit forward of the case side if I had it to do again. I put the left-click button right under my thumb, which is incredible for TRON’s tank turret…left/right with the ball, fire with the thumb. (To get this to fit, I had to cut away a small part of the trackball case.) Later on, I decided to add the right-click mouse button; so useful for Win95 manipulation. I would have had to do some major cutting to fit it on the opposite side of the trackball, if it fit at all, so I decided to place it as you see it, out of the way further up the panel. This turns out to be good…it is away from casual bumping and tiny fingers. I needed a special “black core/red ring” Happ pushbutton for lightcycle pinball flipper button on the side of my case, so I popped some of the buttons apart and put the bits back together in the new color pattern. I used the leftover, swapped out bits on the trackball. Note the distinctive “red core/black ring” on the trackball pushbuttons on the panel. I recommend this panel layout, as it works really well for me. 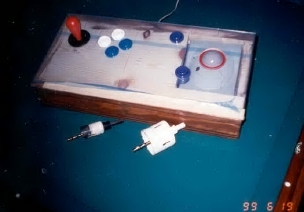 The center joystick is hardwired to a Gravis type 4-button pad control for Player 1, with two keyboard buttons added on to make the set of six. The left stick is wired to the standard Up/Down/Right/Left MAME keyboard set, with Lcontrol, Lalt and Enter on the front row, some other keys on the back row. This gives Player 1 the fast joystick response, and gives the other stick control over the Arcade At Home interface. 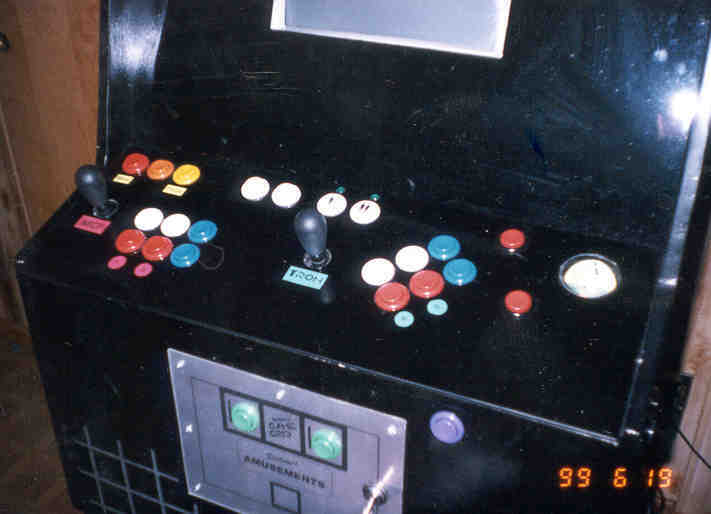 The angle of the buttons shown gives maximum room for two players in a tight space. 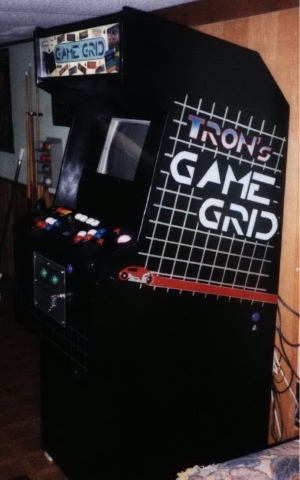 The original clear trackball is a permanent part of the Tron machine, so I will be showing you what to do using a similarly-made gray trackball on another control panel I am building. It is non-lit and opaque, but the trackball design is almost identical to the CompUSA transparent one, and will be fine to show some of the construction tricks involved. I used ¾” cheap clear pine for the structure of the control panel, with a 3/16” thick clear Plexiglas cover. When you decide on the dimensions of your pine panel, go to a hardware store and ask about 1/8” to ¼” Plexiglas or acrylic, and hav them cut you a piece, same size, to fit the board. Here it is shown clear, not yet painted, so that you can understand the mechanics of putting the case together. Here is a similar control panel under construction, also showing the type of hole drills you will need. 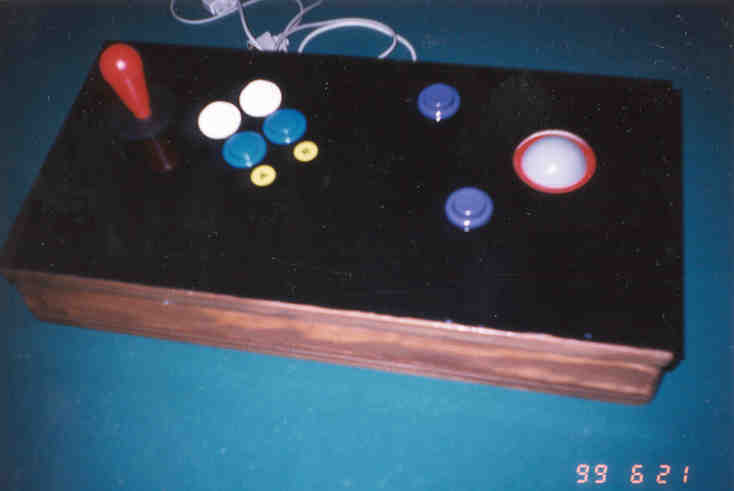 I used a 1-1/8” bi-metal hole drill for the buttons and stick, and a 2-1/4” hole-drill for the trackball. They are expensive tools, but you will certainly need them again when all your friends want you to make them control boards, so treat yourself and buy some good ones. You will also need a reversible drill, possibly variable speed if you can. Note how the trackball fits into the pocket cut in the wood panel. Most standard Happ joysticks and pushbuttons fit fine in a 1-1/8” hole, so plan out your panel and figure out where you want to put them. Using a good power drill, drill out the holes you need. The tough part is the trackball. You will need to decide EXACTLY were you want it to be, and plan the positioning so that the trackball fits inside the panel. Be SURE before you go cutting any holes that the trackball case will fit INSIDE your panel space. The sample picture here shows I had to allow for the ¾” case side. Although it is shown here almost finished, the FIRST thing you must do is drill the 2-1/4” hole in the wood of the rectangular pine panel board. Now, all your main holes should be finished…and we move on to the hard bits. Working with plexy is tricky, so follow this closely. Lay your panel-sized piece of plastic down on a smooth, clean piece of pine scrap. Remember to leave on the clear “wrap” that protects both sides of your plexy. Position the now drilled pine panel exactly over it, and c-clamp it to the pine scrap, and to the table if you can! Put on your safety goggles now! Remove the inner drill bit from the two hole drills. Place the hole drill inside a hole you already drilled in the pine panel, as we are using that to guide the cuts in the plexy. Check the c-clamp again. Put the drill in REVERSE and begin gently pushing down. The backwards drilling will create heat that will help produce a clean hole in the plexy. When you “feel” the drill bit speed up, pull it out and verify that you are all the way through. Use a screwdriver to remove the plastic disk from the drill bit. Repeat this until all your holes are drilled. Now, the big time! Put that big ‘ol 2-1/4” bit in, and repeat the process with the trackball hole. When done with that, remove the c-clamp and inspect your panel. You will need to *gently* clean the plastic spurs off the edges of the holes. Fingers are best, or if not, a *careful* nipping with some long-nose pliers. When you are happy it is clean, set it aside. Now you must guesstimate the footprint of your track ball in the panel. As shown on the new panel detail, mark this on the pine panel, and use a jigsaw to cut away the square shape around the round trackball hole we just used for a guide. Place the plexy atop the panel after your cut, and test fit the trackball case in the square hole. Keep nibbling until you have enough space for the trackball and about 1/8” “wiggle room.” When this is done, cut a ½” strip from the end of the spare wood piece you just cut away, and mount it back in the case to support the far end of the plastic. Now the trackball. Look underneath and you should find at least four tiny screws holding the trackball together. Remove them, and open the casing up. You will find the trackball mechanism in the base of the case, held down by several more screws. Remove them, and set the mechanism down on a clean work surface. You will need to trace the back of the circuit board and solder two wires to the contacts that connect with the board’s left and right pushbuttons. Set this and the ball aside, along with the screws. This done, take the case apart again. You now want to spray paint the inside of the clear case with a gloss black spraypaint to limit light leak on the finished panel. Give it several light, fine coats of the black gloss, giving it ample time to dry. If you want to use a 6V bulb under the trackball, de-solder the LED’s and mask off the bottom center of the trackball case so that light will be able to shine through it. If you will be using the LED’s then cut a round circle of aluminium foil and rubber cement it to the bottom of the case after you spray it black. This will drive all available light up through the clear ball. When the case is ready to be handled, run the new switch wires out through the drilled hole in the case side, and re-assemble the track ball back into the case. Close the patient, doctor! 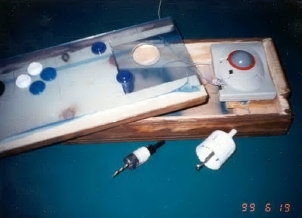 This shows the case opened, revealing the recessed trackball, wood pocket, and clear plastic cover. 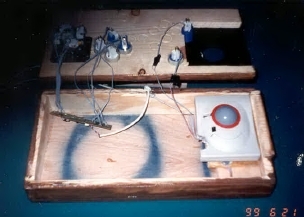 I used several wood children’s blocks inside the wood case to raise the trackball mechanism up so the ball would protrude out of the panel hole in the plexy. (Don’t tell my daughter! :) Use some good silicone or Liquid Nails to put the supports in, testing every time you add a new layer of support. You want a firm fit! When you are happy with the feel and height, put two drops of that adhesive onto the wood, and position the trackball for good fit, noting that the left-click Happ button has the needed space to fit. When it sets, that ball is there for good, pal, so test fit this carefully! BTW, if you are using a Happ joystick in this project, I recommend 1” drywall screws to go through the four holes on the base of the stick and into the underside of your ¾” pine panel. Works great! Here is the case with the plastic painted, the buttons in place, and the lid flipped up for inspection. You just position the plexy over your panel, and pop in the Happ pushbuttons, and mount the restraining rings on them to hold them in place. 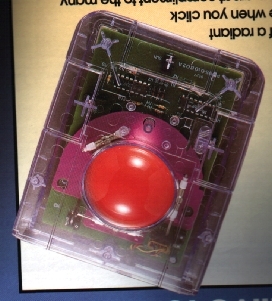 If you have done this right, the trackball should be positioned directly under the large hole in the Plexiglas, as shown. In my case, the buttons are spread out enough that they help hold down the plastic to the panel. You are done! WARNING: Power tools are for Big Boys and Girls. If you don't know what you are doing and burn, cut, slice, injure or otherwise harm yourself, it is YOUR problem, and not mine. God gave you two hands and a big brain; be careful and don't hurt yourself!